Childhood Memories. Pat Suckling (Ne Plant) - a Memory of Ash Vale. My grandfather owned a house in Charthouse Road, Ash Vale. It was the last house on the left. My mother grew up in this house along with two brothers and two sisters until she was married. When the grandparents died my mothers brother took over the house and brought his family up. My sisters and I spent a lot of time visiting and staying for holidays. It was a lovely little road with our houses to the left and an orchard on the right. My cousins and I were always getting caught scrumping the apples. Behind our houses a short walk took you to the canal and boat house. When you crossed the iron bridge it was all forest, heaven for us kids to play. Further up the road into the forest was army country, we used to stray up there and find all the training things like dug outs and first aid posts. Very interesting until you were spotted and they blew a whistle and chased us off. It was a lovely lazy little village. An old fashioned station with ( I think) wooden platforms. Soldiers used to march up to the bridge and tanks and jeeps. Some used to give us kids sweets. Our house had an outside privy consisting of a wide wooden seat with a large bucket thing underneath, men used to come round once a week to empty the buckets. Hard luck if you were sitting on it. 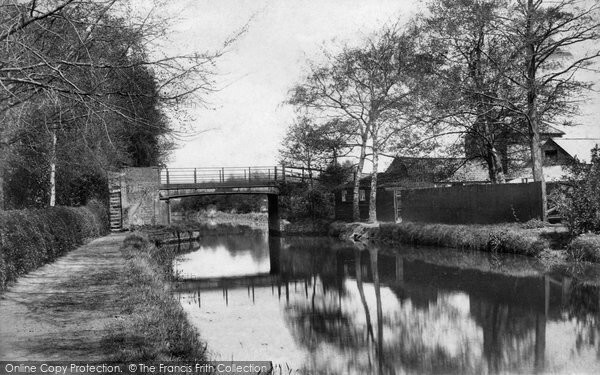 Alas these days it's all changed, the cottages are still there but the orchard is built on , the bridge is blocked so no access. My sisters and I still think of it as home although we live near London now. Very happy memories. A memory shared by pat.suckling on Feb 12th, 2017. Send pat.suckling a message.